My grandma recommended this book to me years ago but it was out of print so I couldn’t get my hands on it. Some years pass and enter Amazon. She is still shocked it was so easy for me to buy it and that I got it for a reasonable price, ( as in 20 or so cents). 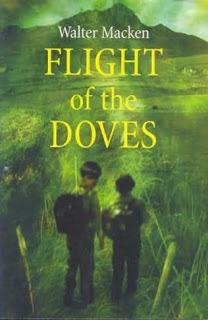 Flight of the Doves by Walter Macken, is about the two flight of the two Dove children. They are being treated very poorly by their stepfather after their mother dies and they decide they are going to cross the water from England to Ireland and find their grandmother. Their stepfather is more than happy to not care that they are gone until he finds out they are heirs to a large some of money. Then the chase begins. The make it to Ireland very early in the book and then spend the rest of it roaming the Irish countryside trying to get home to their grandma. All in all, I really liked this book. I started reading it about 11:30 last night, planning of just reading a few chapters, when I looked up it was 1:00 in the morning and I had finished it. It was a sweet story about siblings who adore each other and take the pains to take care of each other. It is not the best written book I have ever read but it is sweet and it is a very easy read. So, if you find yourself in the need of an easy but fun read, pick up Flight of the Doves.